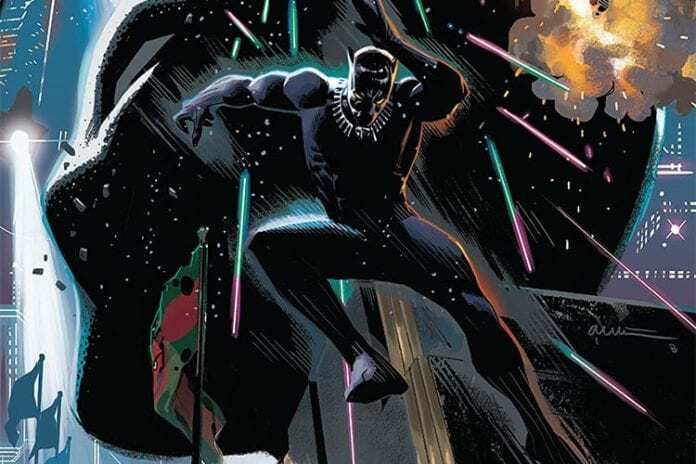 BLACK PANTHER Meets Star Wars In "The Intergalactic Empire Of Wakanda"
BLACK PANTHER: THE INTERGALACTIC EMPIRE OF WAKANDA is a smart, action-packed story that gets its hooks in you on page one. Daniel Acuna's art is absolutely stunning and surreal; it reminds you of Kirby's cosmic work at times. 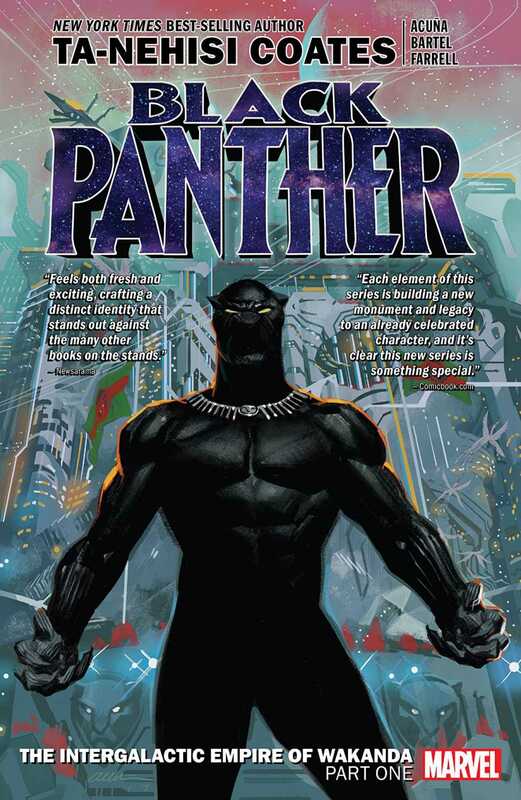 Black Panther: The Intergalactic Empire of Wakanda Part One is out this week, and it’s an epic cosmic adventure worthy of a king. The series is by National Book Award-winning writer Ta-Nehisi Coates and artist David Acuña (with special thanks to David Navarro). Artist Jen Bartel worked on issue #6, with layouts by Paul Reinwand and colors by Triona Farrell. Joe Sabino letters the series. “Two thousand years ago, a detachment of Wakandans established a small, desolate colony on the outer edges of the cosmos. Separated from their homeland and besieged by the whims of deep space, these Wakandans pushed their country’s traditional notion of self-defense to radical ends — true self-defense meant the conquest of all potential foes. On this bellicose ethic, a small, starving colony was transformed into an empire spanning five galaxies. Now these space-faring Wakandans have set their acquisitive eyes on a new galaxy — our own. The comic gets its hooks in you on page one with these words. You know immediately that this is going to be a Black Panther story unlike any you’ve read before. If you’ll allow me a moment of subjective thought, I’ll give you my personal experience with this story. I stopped reading Coates’ initial Panther run around issue 10. It supposedly found its footing after that and people were really enjoying it, but I never followed up on it. Wanting to get back into the series, I decided to give “The Intergalactic Empire of Wakanda” a shot because I heard it was a good jumping-on point. I went into the story ice-cold, not bothering to catch up on the previous series. To quote one of television’s best shows: holy mother forking shirt balls, you guys. This series blows you away. It’s got grand, cosmic action, the story is intriguing and mysterious, the characters feel familiar, and Daniel Acuña’s art is phenomenal. His colors are surreal, and his linework is sophisticated. The art is full of energy and motion to keep your eye moving. The colors have distinct Kirby-vibes to them, which is about as high praise as you can give comic art. In one character in particular, the cosmic Kirby influence is especially apparent. This is a hard series to talk about, because the mysterious element is largely why it’s so great. You should really go into it cold, as I did, to get the full effect. However, if you want some very light, non-spoiler discussion about the story, read on. We meet T’Challa as a prisoner in space, a slave to the empire founded in his name, with no memories of his past. He’s broken out by rebels, after which he joins their cause to take down the Intergalactic Wakandan Empire. The rebels have familiar names, but are they the same characters fans have come to know? It’s unclear. And how did T’Challa get here? Also unclear. What is going on? Who the hell knows. Coates and Acuña don’t hold the audience’s hand with this comic. They throw you into the deep end and trust in your ability as a reader to follow along. That trust creates an urge to keep reading, and a need to know what’s happening. You won’t be able to put this comic down. And because of Acuña’s fluid art and Joe Sabino’s lettering, you’ll be through it in no time. And speaking of Sabino’s work, his sound effects on Black Panther are really something to study. The way he letters them, they’re fun and playful, and they match the Kirby-esque vibrance of the art. They don’t feel like traditional comic book sound effects; they look unique, which just adds to the book’s special quality. “The Intergalactic Empire of Wakanda” is Star Wars by way of Black Panther. The influence is obvious: you have a band of rebels trying to take down an evil galactic Empire, the members of which are repeatedly referred to as “imperials.” The space battles all look and feel like something out of the Original Trilogy. And, to be clear, none of this is detrimental to the series. It doesn’t feel derivative or lazy; it feels awesome. This is a mashup that we didn’t know we needed, but now that we have it, it’s so fulfilling. Can you imagine getting this up on the big screen in the MCU? Suffice it to say, you should definitely pick up Black Panther: The Intergalactic Empire of Wakanda Part One. It’s something totally unfamiliar to the world of T’Challa as we know it, and yet it speaks perfectly to the heart of the character. It’ll have you craving the next volume as soon as you finish it. I agree. Can potentially go down in history as one of the best BP stories! Original artist definitely needs to return ASAP!